This luxury Italian wool scarf is lightweight for beautiful draping, yet warm and longlasting. Made from the softest lightweight fine wool gauze in a tubular construction, making it a double thickness. Just the perfect accessory this season! Many styling options: wear it draped over your shoulders as a shawl or styled as a long fashion scarf around your neck. Generously sized at approx: 25" x 68" (64x 172cm) for a beautiful drape and versatile styling options. Eyelash hem. 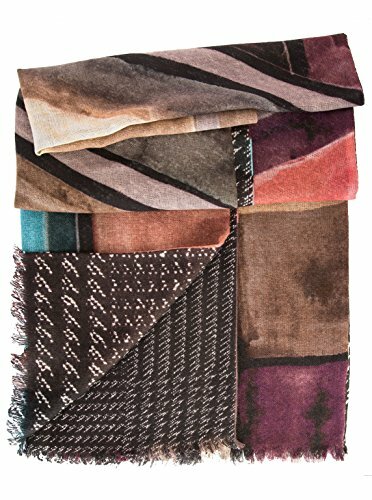 Two prints, one a black and white, the other an abstract geometric in rich colors to give your look Italian style while keeping warm. Handmade for Elizabetta along the shores of Lake Como, Italy. We make these in small quantities so that you know you are wearing a unique piece of art.